A few weeks ago I posted a photo on my Instagram account of the pancakes I had made for breakfast that day and several followers asked me for the recipe. The truth is, I never thought that you would be interested in seeing a recipe for something so basic, but that’s actually the reason why I decided to post it on the blog and on my YouTube channel. When I was a kid I never new what pancakes tasted like since you couldn’t find them anywhere in Colombia. At home, or any other place, we always ate very typical Colombian breaksfasts that consisted of arepas, eggs, pandebonos (cheese bread), buñuelos (cheese balls), etc.. Then, after having lived here for a while, I finally had a chance to taste them and I loved them. 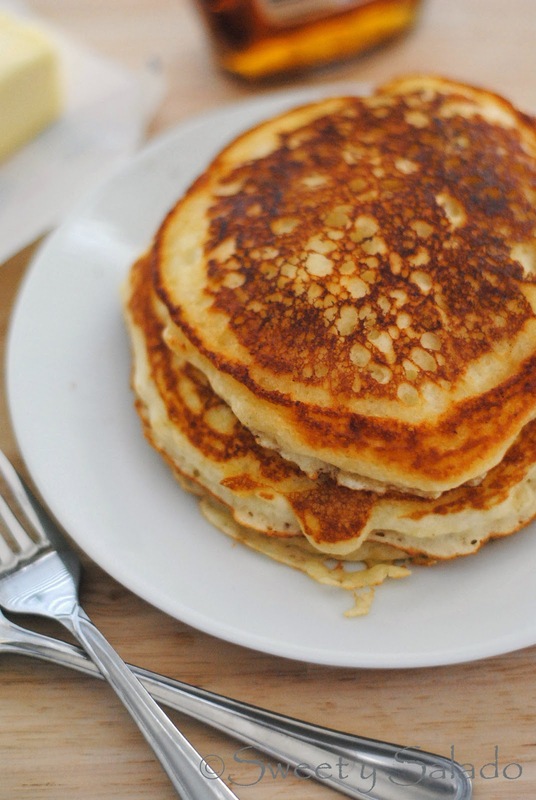 The recipe I’m sharing with you today is very well known in the US because of the use of the buttermilk since once you mix it with the baking soda it gives you the most incredible, fluffy pancakes. I got the base recipe from the Martha Stewart web site a long time ago and all I did was substitute the milk for the buttermilk, add the baking soda and lower the amount of salt since many recipes I had tried before, including this one, asked for an enormous amount of salt, for my taste anyway. 1. In a small bowl mix the flour, sugar, baking powder, baking soda and salt and set aside. 2. In a medium bowl mix buttermilk, melted butter and egg. Then, add the dry ingredients until combined. You should still have some lumps in the batter, so do not overmix. 3. Melt butter in a large pan or skillet over medium heat and add about ¼-½ cup (60-120 g) of batter per pancake (depending on how big you want them). Cook for about 2-3 minutes until the edges are a bit dry and bubbles appear on the surface. Flip them over with a spatula and cook for another 1-2 minutes. Continue this process until you run out of batter and serve immediately. 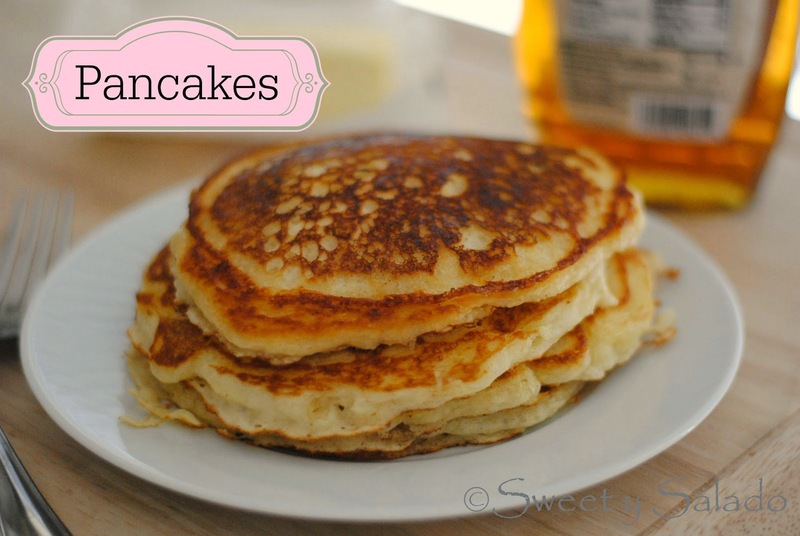 Inspired by Martha Stewart: Easy Basic Pancakes Recipe. Soo good!These are the best buttermilk pancakes I've had! And I did not even have store bought buttermilk, I also followed your buttermilk substitute recipe.Muchas gracias Diana☺☺! Thanks for the recipe my whole family loved it! That's great news! Thank you so much for making them!